After three weeks at the top, the first serious challenger to Black Panther has arrived, in the form of a classic of sci-fi literature with some of the strongest name recognition you could imagine. It's probably still not enough. A Wrinkle in Time is the adaptation of Madeleine L'Engle's award winning young adult novel of the same name, about a young girl who is transported, along with a group of her friends, into an interdimensional battle after her scientist father goes missing. The fantastical adventure involves supernatural, eternal beings, exotic planets and creatures and a fight against the very concept of evil itself. It's quite the ambitious piece. Although it's previously been seen as a TV movie, this is the first big screen adaptation and has been given to Ava DuVernay of Selma fame, along with a massive budget to properly render the giant scope of the novel's settings. 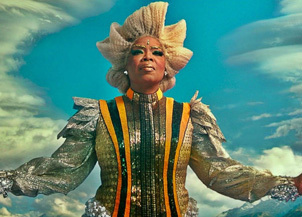 What's really backing it, though, is Disney's production weight and the presence of producer and star Oprah Winfrey. While she's rarely meant gigantic box office, she's created a massive awareness around this film just by being in it, and has given it an air of legitimacy and seriousness. Will she perhaps be a little controversial? Maybe, but not to the audience that was going to see this film anyway. Also starring Reese Witherspoon, Mindy Kaling, Chris Pine, Gugu Mbatha-Raw and Zach Galifianakis, along with a cast of talented child actors, it's an event picture for the under 15 set, and possibly something that adults won't mind seeing with kids, which is always a plus. There's only so many terrible, super-young kids films that can be tolerated, and an action-adventure fantasy at least offers a change of pace from the typical family fare, along with an unambiguously positive message. Reviews are just middling, though, and it may be a bit overstuffed as a film. Comparisons to Race to Witch Mountain are probably relevant here, albeit with a bit more of a legacy in this case. I'll be looking for a solid opening weekend of around $38 million. Home invasion horror film The Strangers gets a sequel this weekend with Prey at Night, which continues the “burlap bag wearing psychos go after a house” plot. Only this time instead of a young couple, it's a whole family, husband and wife Martin Henderson and Christina Hendricks, along with their two kids. The original film, semi-based on real events, had a surprisingly strong following, but the sequel seems to just go for the slasher elements, hoping we'll accept the loose connection to the first film. Hey, there have been dumber attempts at franchization in horror (Jeepers Creepers anyone?) than a weird mask. Reviews are fairly mediocre for this, though, and the ad campaign lacks both the intensity and frequency of the first film. Without the freshness of the idea, we're left relying on the presumed affinity for a ten-year-old film. With horror franchises being measured in months these days, it's unlikely for this to have any kind of breakout. I'd look for about $10 million this weekend.